If you are interested in discussing how to prepare preservice teachers for the realities of today's digital classroom, then I hope you’ll join me at 9 p.m. EST tonight for #TeacherEdChat. The topic is "Social Media in Teacher Education Programs." The focus of #TeacherEdChat is on teacher preparation and connecting higher ed with Prek-12. The intent of #TeacherEdChat is building bridges with PK-12 to help align those enrolled in teacher education courses, undergraduate and graduate, with teachers and educators in the field. 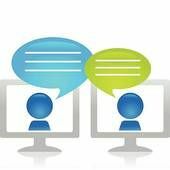 The chat provides a forum to help higher ed faculty and educators gain additional insights into the teaching field as well as help those in the teaching field get a better sense of what Schools of Education are doing. Q1: What success stories do you see from students & teachers use of social media? Q2: What are mistakes have you seen Ss make w/ social media usage? Teachers? Q3: How are people in business and higher education looking at applicants’ social media use? Q4: What does having lots of selfies say about you if you are a teacher? Student? Q5: What do students need to understand about the permanent nature of the internet? Q6: Advantages/disadvantages of being discerning with the number of friends on Facebook / following on Twitter? Q7: Is restricting public access to one’s profile a good idea? Why or why not? Q8: Does profanity ever have a place on social media? Q9: Advice for pre-service teachers about their own use of social media as a role model for students. Come back here later this week for a recap via Storify. The chat was founded by @JenniferFox13, along with help from @JudyArzt, @nathan_stevens, @gregbagby, @NicolRHoward, and @Angie_Wass.